It’s no secret that a vehicle for a trucker is like second home. As a rule, truckers are in their trucks up to 90% of their time, and leave it only on rare stops. If you think more about the figure it becomes clear why they spend so much time selecting a vehicle, both its exterior and interior looks and features. In Rig’N’Roll we did our best to deliver the most authentic reproductions of trucks, hence today we will see three licensed brands of trucks which can be found in the game: Freightliner, Western Star and Sterling. A Truck is a self-moving vehicle designed to transport trailers and semitrailers. A Semi truck is an unpowered means of transportation, used for cargo transportation and designed for hitching to a vehicle so that the latter gets the major part of the load and weight. 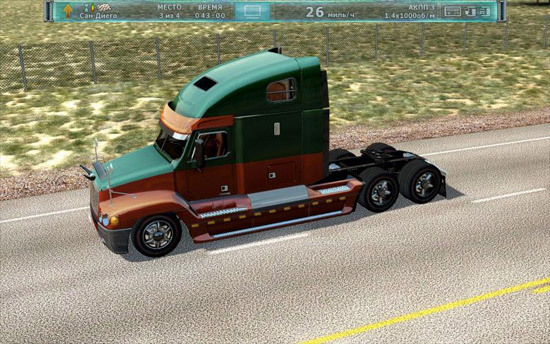 Saddle trucks are the trucks designed to use semitrailers. The story of Freightliner set off back in 1929, when a young driver, James Leland, registered the company Consolidated Freight Lines. Initially he did not position his enterprise as an industrial truck manufacturer. Strange as it may seem, he planned to do simple transportations, and he had nothing against sharing his ideas on new truck structures with any car-manufacturing corporation. However, no one showed interest in Leland’s proposals. The same year, Consolidated Freight Lines engineers decided to start the reconstruction of the trucks they had available. These experiments entailed the implementation of several innovations, e.g. the use of aluminum in brake plates and coating for the van. Generally the company personnel added lots of novelties to the industry, and one of those is well-known to anyone who is into trucks. We are talking about COE (cab over engine) here. The USA had strict legally regulated characteristics of trucks such as weight and the length of the vehicle. Hence, thanks to the shortened cabin, it became possible to attach longer trailers and, thus, deliver more cargo. In 1940, James had not had the courage to take up the commercial manufacture of his trucks; however he teamed with five other transportation companies for mass manufacture of vehicles for private purposes. Leland renamed the company “Consolidated Freightways” and the newborn union got the proud title of Freightways Company Inc.
Consolidated Freightways gradually started to become a truck manufacturer closer to the WWII. It happened when the company procured, for the first time, its production units from another concern for the operative assembly of trucks. A little bit later the Vice-President Tom Tailor made an announcement that Consolidated Freightways was going to have its own commercial manufacture, since it was able to do it faster, and most importantly with higher quality. The final title, Freightliner Corporation, stayed with the company since 1942. By that time there had been some trucks manufactured with the new logo on radiators. The later war years were hard for the company, since unlike many competitors, as it turned out to be quite a task to rebuild the plants to provide for the front. Nevertheless, within the next couple of years the corporation saw steep rise due to the commercial policy of its Vice-President Lester Kassebaum. Later Freightliner Corporation received an order to produce trucks with a sleeping section (sleeper). The idea itself to have a sleeper came from another large manufacturer, however it was implemented in Freightliner trucks and it helped this new company to stay with the market and live till now. Everything went perfectly, the truck sales were ascending, new models were produced... however, something was missing for more development. The so-long-awaited expansion became possible in early 1980s, when a European player, Daimler-Benz, emerged on the US market to sell Mercedes-Benz trucks. The Concern bought out the Freightliner subdivision from Consolidated Freightways and supplied it with all the required resources, hence gaining the brand name known on the US market. In 1997 Freightliner purchased the entire long-haul subdivision from Ford and renamed it into Sterling. And in 2000 a deal was signed to buy another well-known manufacturer, Western Star. This classic series of Freightliner trucks has several designs and state-of-the-art technologies. 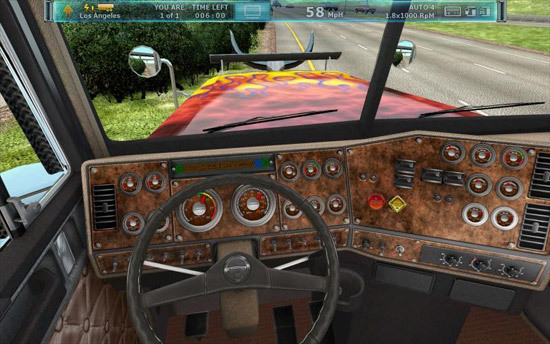 For many years Freightliner Classic XL has been one of the winners of The Truck Show. The original and severe design of the trucks of the series still excites not only the professional driver, but also just simple visitors of the exhibition. Classic XL is a unique vehicle, the longest among other classic trucks – the distance from bumper to the back wall of the standard cabin is 132 inches (3.330 mm). The cabin is made of aluminum alloy, hence providing greater load-bearing capacity and fuel economy. The key concepts of such trucks were developed by the company during especially hard times for the American vehicle-manufacturing times, when the oil prices were up high, and as a result lots of the market players gave up failing to comply with the new requirements of the client. Lots of drivers gave highly favorable feedback towards the interior of the cabin. It’s quite simple to explain. There are two options of Freightliner Classic: a day-cab (without sleeper) and a sleeper box (with a sleeping section, 48 to 84 inches high (121–212 cm)*). 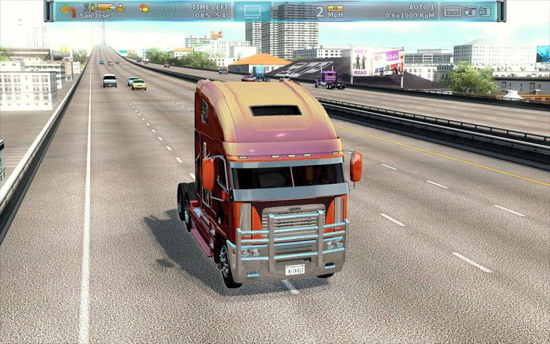 Thus you can choose any suitable version of the truck considering the desired amount of available space. Rig’N’Roll has a version with sleeper since the transportation is done throughout the state, and such a trip may take a couple of days. Surely you will need to stay overnight at motels, since this is exactly what the US truckers do, but still the truck has to comply with the transportation companies’ requirements. Apart from the aforementioned the sleeper has an AC option and even TV support. The interior of the cabin is covered with vinyl panels. The driver’s seat in the Freightliner Classic XL is highly comfortable and ergonomic. Specifically for convenience of the driver the right side of the dashboard is slightly angled towards the driver, which gives it a feeling of a more compact workstation, where everything is within reach. The production version of the board is done as if wood- and reminds some of costly furniture. Despite being large in size the Classic XL give you a feeling of luxury and comfort, which are quite often missing from the trucks produced by competitors who seemingly forgot how important the vehicle is for its owner. It was the very first Freightliner truck, produced following the transfer under management of Daimler-Benz. The title, Century, speaks for itself. 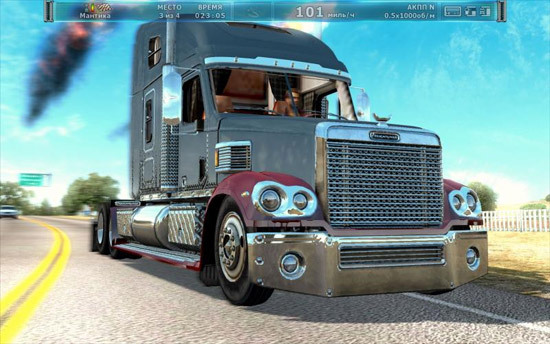 It was a challenge to the competitors, but also to the time, since this model appeared in 1995 and manifested all the Freightliner achievements, the company was about to enter into the XXI century. Engineers were constantly busy perfecting the truck structure, and as a result they got a comfortable and safe transportation unit. In 1999 Freightliner Century received a special mark S/T" (Safety/Technology) to symbolize the safety and technology. The key assets of the Century are a self-adjusting clutch and special aerodynamics of the hood. The latter provides for considerable decrease of fuel consumption, due to the decrease of the resistance level. For that very purpose the truck has a specially-designed radiator grille that increases the air flow and provides for more effective cooling. The cabin is made of light and wear-resistant materials, whereas the vibration regulating system has thorough insulation of the driver from outer noise making the ride in Freightliner Century Class S/T calm and relaxed. Among high-tech stuff on the truck one can specifically highlight the Driver Message Center, being an on-board computer that instantly informs the driver on the liquids’ levels, equipment malfunctions etc. Freightliner Century Class has some other peculiarities. E.g. the bumper consists of two parts: central, made of steel, and side ones, made of plastic. Thanks to this approach, in case of a collision, the total damage sustained by the truck is considerably smaller, and the follow-up repairs will be considerably cheaper. The front wheels turning angle is 50 degrees, which allows for more precise maneuvering during backing and has a positive impact on the general steering capability of the truck. The arched windscreen consists of two parts. This feature, like the idea with bumper, allows a decrease the repair costs. The special safety level is also worth mentioning. For instance Stability Control systems help to regain control in case skidding by breaking and power reduction, and Roll Stability Advisor warns the driver about possible skidding. Generally speaking Freightliner Century Class S/T became the first American class 8 truck to comply the requirements of Swedish and European ECE R-29 crash tests (if not surpass them). One can say it’s one of the most reliable long-distance trucks in the world. Coronado is the most powerful Freightliner truck with a 8 class engine to combine the best features of Classic XL and FLD 120SD. Owing to its large radiator and a long hood, any 8 class diesel engine from 425 to 600 h.p. with the Jake Brake function can be easily located in Coronado. Cabin and some internal elements are made of aluminum to decrease the truck weight and increase its useful load. The dashboard somewhat resembles Classic XL: its right side is curved to keep an eye on all key controlling elements and indicators. Once again the designers made the internal part of the cabin with a slight touch of luxury: the dashboard has Oregon Burl tree fillings, the steering wheel is done in VIP-style – it has chromed spokes with leather and wooden decorations. The front wheels of Freightliner Coronado have a 50 degree turn angle to provide for perfect maneuvering in case of limited space and high-density traffic conditions. Owing to the chromed bumper the cabin has good external damage protection. The structure is aimed at maximum cost reduction in case of a collision, thus the wings can be replaced separately. Argosy got its name form the ancient Greek ship the Argo. It is the “youngest” Freightliner truck, with the first vehicle produced in 1998. More than $70 million was spent for the development but it was well worth it. Argosy has not only a unique design, but also perfect technical characteristics. For instance the growth of the overall load does not impact its stability and steering capability. Moreover Freightliner engineers did not forget about the comfort of the driver, and resolved the issue with getting into the cabin: they placed steps from the driver and passenger sides, which are extended depending on if the door is closed or opened. 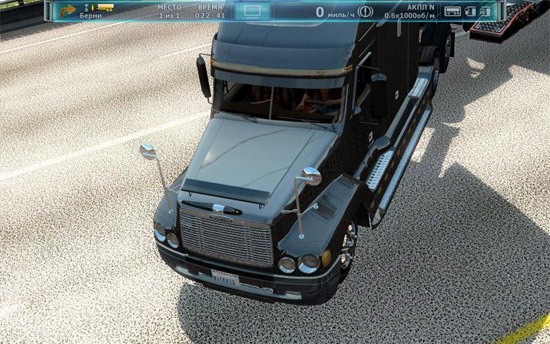 Multiple improvements are to be found in the Freightliner Argosy, which was developed for other models, but were never implemented due to various reasons. For example these are heat-insulating partition wall between the engine and the driver’s cabin, which was designed back in the day when they worked on the Century Class. Surely the most attractive feature of the Argosy is that it does not have a long hood, which is attributable to the most long-distance trucks, as well as Freightliners themselves. The engine in this model is located where it has to be – behind the radiator grill underneath the driver’s seat. Owing to this solution the structure of the cabin became much more reliable (SAE** standards exceeded). The Argosy also stands out due to its maneuvering capabilities. Thanks to the wheel turning angle (50 degrees) and the distance between the center of the front axle and the bumper (40 inches) the truck has improved load transition. The internal fitting of the cabin also underwent several changes, although the dashboard is curved according to the good old tradition. The driver’s information system is now fully compatible with a DLU (Data Logging Unit), allowing it to receive and record all malfunction notifications. Moreover this data can be easily transferred to a standard PC to find out the reason for such malfunctions. The history of the Sterling brand is not that interesting as Freightliner. The most interesting fact is probably that there are five different companies named Sterling. Moreover, all of them were founded at different times, by different people, but all of them are related to the automobile industry. Nevertheless, presently there is only one manufacturer with the name Sterling, which is, as it stated before, the former Ford truck subdivision, purchased by the Freightliner concern in 1999. Heavy, long-distance trucks are represented by several modification vehicles with the А9500 index, which are distinguished one from another by various technical parameters (engine brand and power, type of gearbox, suspension, dimensions and the looks of the sleeper). Silver Star is the definitive flagman of the А9500 series. Silver Star comprises all the best assets of Sterling – it’s a powerful, reliable, easy to handle, comfortable and a really good-looking vehicle. This is a typical American truck, designed for long-distance cargo transportation, produced and equipped to ensure that the driver feels like home inside the truck. However, the base frame of the truck is not interesting to the buyer. Standard equipment includes just marker lights on top of the roof and air purifier. For extra money the Sterling 9500 gets multiple additional features like the improved aerodynamic package etc. Sterling 9500 is available in two wheel arrangements – 4x2 and 6x4. The game features the second option. It weighs 30 tons. The stellar flagman is indeed a long-distance EX 4900 truck, which is primarily designed for single truckers, who prefer classic vehicles. Starting from 2002, Western Star EX 4900 was produced in LowMax version with the sleeper height being almost 1 foot lower than the standard versions. LowMax reminds of a race car, but at the same time it keeps all the beauty natural for classic American trucks. The center of gravity of the vehicle is located very low, providing for greater stability and steering capability and making it suitable for towing trailers with high centers of gravity – rack cars, grain hoppers, cattle trucks, – and also for transportation of sea yachts.